IDYLL: When Marion Hartung wrote her Book 5 in 1975, it included a sketch and written account of the only known amethyst Idyll vase. At that time, it was owned by a couple in Columbus, IN. It apparently remained in their hands until Bob Patterson was able to purchase it in the late `90s. (You may read Bob's article on that vase by clicking here.) 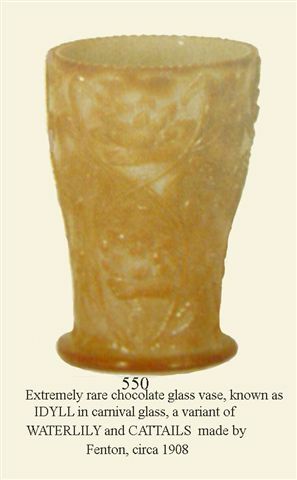 That same vase was sold during the March 2009 San Diego/Southern Calif. Convention by Seeck Auctions. Sale price was $450. Sadly, there is a crack around the base of this vase. When Wroda Auctions sold the collection of the late Mary and Lamar Sharp in May 2008, the marigold Idyll vase of 6” in height, sold for $1100. We believe this to be the fourth vase known in marigold. It would seem that variation in shape and iridescent application indicates an experimental basis, perhaps never finalized and entered into production. These “sample” vases may have been made up for the “traveling salesmen” of that period in history, with no orders forthcoming. 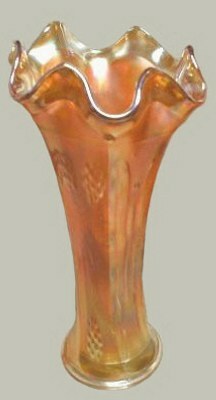 A marigold Idyll vase having a “cupped top” is on record as selling in 2003 for $825. It has been stated that this vase is part of the Waterlily and Cattails family, but in comparing patterns, it becomes evident that only in this IDYLL design does one find two Butterflies, making the vase a Variant in its own right! IDYLL in Chocolate Glass: Chocolate glass was produced by Fenton in the 1908 period. It is not known whether the Idyll mould was originally created for use in Chocolate or Carnival Glass production. Ice Green and White Panels Vases. PANELS: These 11-12" vases having six subtle panels extending to scallops at the 3 1/4" base. It is a three-part mold. Found somewhat infrequently, in marigold, cobalt blue, celeste, ice green and white. BUTTERFLY & BERRY 9 in. in Green! 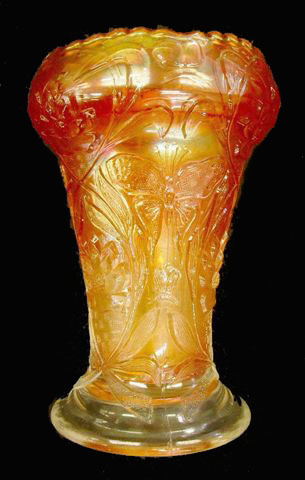 BUTTERFLY & BERRY Vase - Marigold. BUTTERFLY & BERRY Blue Vase. BUTTERFLY BERRY: Considering the broader scope of pattern use in other shapes, vases are few in number. They are seldom more than about 9” tall and most of the pattern is lost in the “swinging” process. Most have pulled up flames at the top, but some are known to have the tightly crimped top edge. Amethyst, blue, green, marigold, red, red slag, along with extremely scarce white examples comprise the color scope. FLUTE: Having a base size of 2 ½”, the heights vary between about 8”-11”. When we say that marigold is the usual color, that is not to say they are readily found. More scarce colors are cobalt, smoky blue, green, vaseline, amethyst, red and amber. Since there is no distinct pattern, it is quality of iridescence, lack of damage, and desirous base glass color which promotes desire to own. 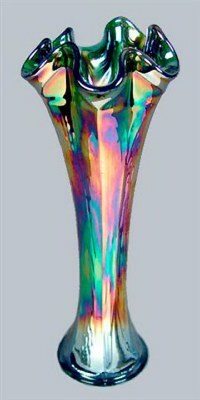 Left - PLUME PANELS Vase - 9 inches tall in Amethyst. Right - PLUME PANELS - 11 inches tall in Marigold. In this passage, Solomon affirms God's sovereignty over all human life.